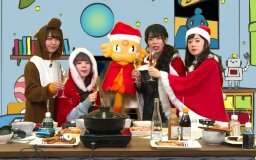 This was a Christmas special broadcast of RekuNyan no Game Beya. Both Aimi and Itou Ayasa were there, and the guests were Aiba Aina and Kudou Haruka. 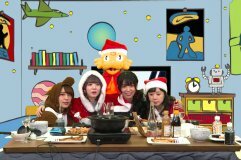 Aimi was wearing a reindeer kigurumi, and the others were wearing santa hats and capes. For the first 20 minutes, they just ate and drank. They spoke in Osakaben a lot.